An important part of a good SEO is the incorporation of meta tags, which are commonly located in the header of our website and which, in the same time, are invisible to users visiting the site. Well, to be more succinct, these tags have only one purpose: to include information about the page such as author name, date, key word, description, title, among others. However, here we will only mention one, which is the meta description in Blogger, this description will appear as a fragment in the search results and as a description when sharing on Google+, Facebook and other social networks. A clear and precise description increases the chances of getting visits or clicks. 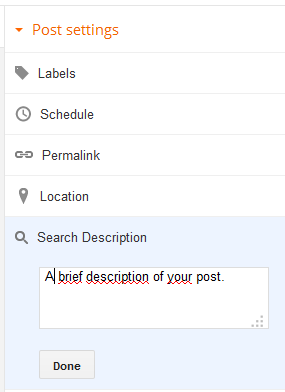 As we will work only on the Blogger platform, here I leave a little guide to easily add a meta description. The first thing we will do is going to our Blogger dashboard and go to Settings > Search preferences > Meta Tags > Description and click on Edit. Then check the box "Yes" to enable search description and finally click on the "Save Changes" button. Now we will focus on adding the meta description to individual pages. Simply edit the page or post, look for the Search Description setting, where we enter the text and then save by clicking on the Done button. You are ready, however it is best to test if it works and we will do so with the MetaChecker online tool, where we only have to introduce the url of a post or page, click Analyze and then it will show the results, including a complete analysis of keywords, on-page seo , meta tags, URLs, current server status and a rating bar that goes from Horror to Excellent. And, of course, we will use again the previously mentioned tool to ensure that the description is placed correctly and if all goes well, your blog would already be ready to face a good SEO.